GET THERE EARLY TO GET IN AND GET YOUR HANDS ON SOLID GOLD GOODNESS…. A celebration of the music, beer and city we love. Bristol Beer Factory is honouring the city’s musical heritage, underground DJ culture and dub plate pressings with its very own Vinyl Series of beers. BBF has brought some of the city’s best DJs into the brewery to create something special… starting with BOCA 45! To celebrate the release of his brand new single - BOCA will be spinning his 45s alongside his Bristol pals. At the same time we’ll be launching the BOCA 45 beer that we brewed with him to celebrate. Get down to the Galli to experience something totally unique. We will have 20 Limited Edition gold BBF x BOCA single 45s to give away on the night, keep an eye on here for more details coming soon. Forty Five is the soundtrack of a life. A revolution in sound played out in stacks of 7” singles; a long player that pulls together the numerous disparate musical strands that have made Boca 45 (aka Bristol based record selector Scott Hendy) the DJ he is today, in his forty fifth year on Planet Earth. Having previously made records for Grand Central, Jalapeño, Island and Domino, Boca 45 returns with a twelve-track album that’s semi-autobiographical and full-time firing on all cylinders. The first single from Forty Five - Bryan Munich Theme - sounds like an incendiary lost ’70s library record; the perfect funk-flecked walk on music for a team of doughty outsiders destined to lift the cup. 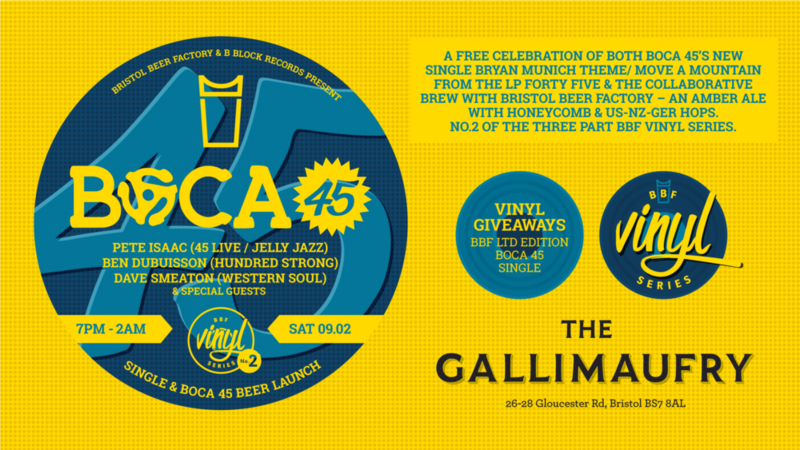 An extremely limited number of gold vinyl 7”s have been made in conjunction with Bristol Beer Factory to tie in with the launch of a Boca 45 amber ale (as part of the BBF Vinyl Series). We’re all set for a lovely little shindig – are you?